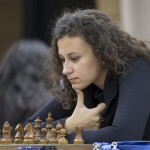 After the third round in the open section has a sole leader grandmaster of Armenia Karen Grigoryan. An initiative on the Black, and they make active, although somewhat risky move. Careful (and thus, probably even stronger!) 29…Bc5, then 30.axb5 Bxb5 very bad for White. Such sampling is usually done automatically, but in this case much stronger than 30…Bxb5! – leave White line “and” closed, but we are creating a nasty threat 31…c3. Now White appears some counterplay. 31…Bc8 32.Qe1 Kh8 33.Nd1 Rxe2 34.Qxe2 g4 35.Bf1 f4 36.Ra8 Qd4? The situation is out of control: Black» created the threat of a double capture on g3, but completely forgot about their King. Correct was 36…Qf5 (the most reliable: the pressure figures should protect each other!) or 36…Bc5; Black’s chances are still higher, but the position has worsened dramatically. 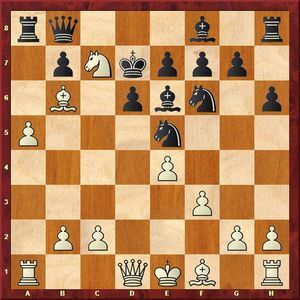 Fork, as if to protect the rook Bishop – 38…Rd8, then solves another fork: 39.Qxh6+ Kg8 40.Qg5+. An abrupt change of scenery knocked Norwegian Junior out of the rut, and he was confused. 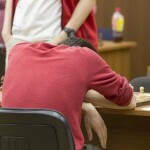 Puts Black on the brink of defeat, whereas after 38…Ra8! 39.Qxh6+ Kg8 40.Qxd6 Qxd1 they’re out of danger: threatened Ra1, win the rook on A8 with checks White does not work, so they have to force a draw by perpetual check. 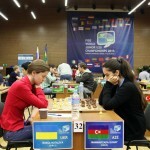 39.Qxh6+ Kg8 40.Qg6+ Kf8 41.Qf5+ Ke7 42.Nc3 Kd8 43.Ne4 Qb6 44.Qf7! 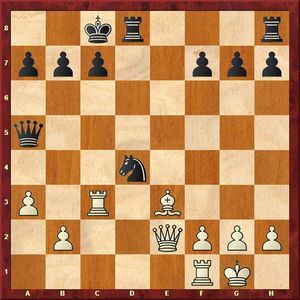 Not allowing the Black» King to escape to the Queenside. 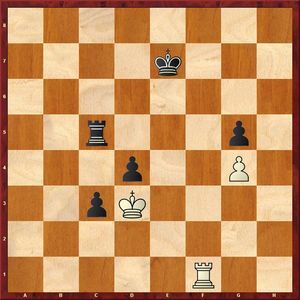 In the case 44.Qxg4 Kc7 45.Bh3 Rd8 fight started to go on three results: Black» hid their King, and their far-moved pawn b5 and C4 are quite dangerous. It’s hard to resist the temptation to pick up the figure, but the game enters the endgame – which means that the Black King will be able to breathe a sigh of relief. Therefore deserved attention 46.Qxg4 Qxd5 47.Nc3 Qg5 48.Qe6 and Black’s position is very dangerous. In the case 49.Be2 Kc7 Black appears counterplay. 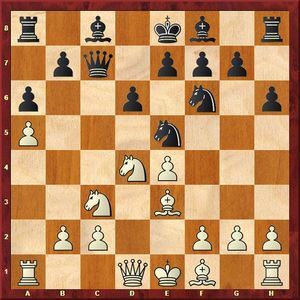 Grigoryan takes a practical, solution – gives up a knight for the pawn “b” and “c” but it is not excluded that this misses the win. 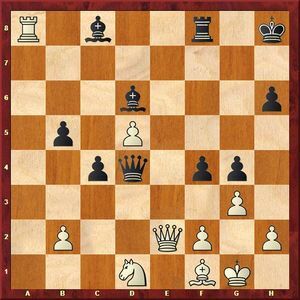 The critical moment of the end: it seems that Black is saved to the sketch-move 58…Rh7!! 4) 59.Kg6 Rh2 60.g4 Rxf2 61.g5 Kf4 62.Kf6 Kg4+, and tempo in the tempo Black done. In the party all over prosaic: passing with the support of the King ran in Queens. Harder 60…Rh6+ 61.Kg5 Rb6, but after 62.f5 Ke5 63.g4 Rd6 64.Kh5 White needs to shake the opponent’s defense. 61.f5 Rxg3 62.Ke6 Kf4 63.Re3 f6+ 64.Kd7 Black resigned. Mikhail Antipov could join to leadership who was achieved Black overwhelming superiority, but casually held the end. Immediately won the retreat of the King to d6 or E6 with the threat Re5+. 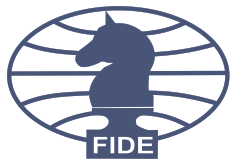 If the Bishop moves from d3, d4-d3+, and the pawn can’t be taken because of the Shah with E5, and not to take too impossible. Instead, Black moved into a rook ending with two extra pawns, which is also good, but the fight continues. 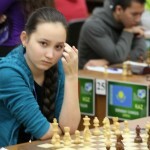 It was better to go the King forward: 56…Kd5 57.Rf5+ Kc6 58.Rf6+ Kb5 etc. 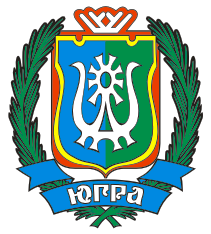 Unjustifiable extravagance. After 57…Rd5 Black rebuilt their forces and won. And this position is, apparently, already tied – the Black King can’t move to 5 horizontal. 61.Kd4 Rc8 62.Re1+ Kd7 63.Rc1 Kd6 64.Ke4 Rc5 65.Kd4 Rc8 66.Ke4 Re8+ 67.Kf3 Rf8+ 68.Ke3 Rc8 69.Ke4 Rc4+ 70.Kf5 Kd5 71.Kxg5 Ke4 72.Kh5 Kf4 73.g5 Rc3 74.Ke3 Kh6 Draw. 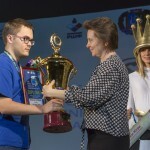 The first won the champion of Russia among juniors Maxim chyhayev. 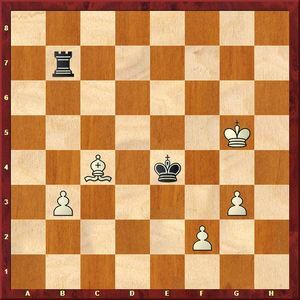 The endgame White stocked trump – created a secure checkpoint on b6. But so far on the Board in the middle of the middlegame, Black and begin to “feel” the opponent on the Kingside. The Bishop is not caught, but to weaken the cover of their King White must. 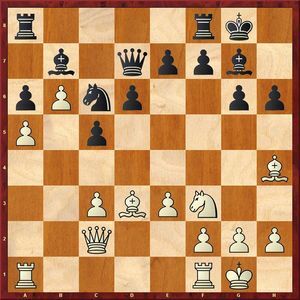 The move 24.hxg3 White might not like it because of 24…Ne5 with the threat of Qh3 and mate on h1. 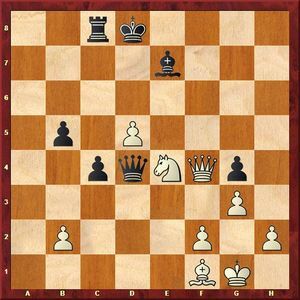 Best 24.Bxg3!, but taking such unusual, often invisible (we saw the same thing on the example of the party Grigoryan – Taree, when Black does not beat on b5 Bishop). Yeah, what a bad move in party? 24…Bd4+! 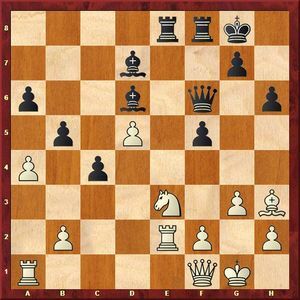 That’s all: White resigned, because after 25.cxd4 Qxd4+ 26.Kg2 Nb4+, they lose their Queen. 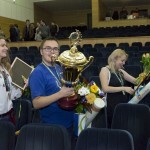 Unexpected and very beautiful idea: Belarusian chess player captures Black borders on the Queenside. The refusal to accept sacrifices did not bring relief – 10…Qc6 or 10…Qb8 also would have followed 11.Bb6. Quite sad for Black is 11…Qd7 12.Nxb5 Rb8 13.Nc7+ Kd8 14.Na6+. 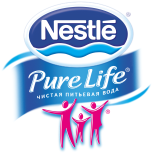 Simple and strong human decision. The computer shows the Jesuit version 15.f4! 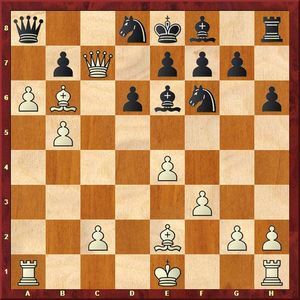 Bg4 (if away knight – 15…Nc6, 16.f5, and caught the Bishop) 16.Be2 Bxe2 17.Qxe2 Nc6 18.e5 Ne8 19.e6+, etc. Harder 15…Nc6, but after 16.0–0 still Black not to be envied. Again, simple and strong. Electronic intelligence suggests that even better 16.a6 bxa6 17.Nxa8! axb5 (or 17…Qxa8 18.Rxa6 Qb7 19.Qa1) 18.Ra7. 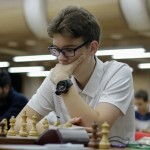 And White realized his advantage: 23…bxa6 24.bxa6 Bd7 25.Qxd8+ Qxd8 26.Bxd8 Kxd8 27.a7 Bc6 28.a8Q+ Bxa8 29.Rxa8+ Kd7 30.Bc4 e6 31.Ra7+ Kc6 32.Rxf7 d5 33.Bd3 dxe4 34.Bxe4+ Nxe4 35.fxe4 Bb4+ 36.Ke2 g5 37.Rd1 Bd6 38.h3 Ra8 39.Rf6 Black resigned. 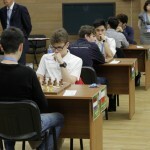 Black deftly played the Chigorin defense and won a pawn. But yet to lose in this position White should not yet. After 16.Bxd4 Rxd4 17.Rfc1 Rd7 (or 17…c6 18.b4 Qd5 19.b5 Rd8 20.bxc6 Rd1+ 21.Rxd1 Qxd1+ 22.Qf1 b5 23.Re3 Qxf1+ 24.Kxf1 Kc7 25.Re7+ Kxc6 26.Rxf7 Rd7) 18.Rc5 Qb6 19.Qg4 chances equalized. Perhaps more chances for a draw after 17.Qxd4 Rxd4 18.Bxd4 Re8 19.Rfc1 Re7 20.Bxg7. 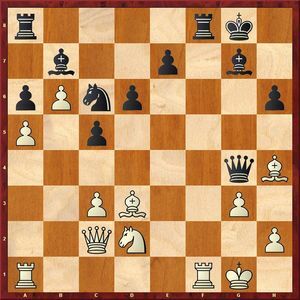 17…Ne2+ 18.Kh1 Nxc3 19.bxc3 Qa6 20.Qf5+ Rd7 21.h3 g6, and Black have implemented material advantage.